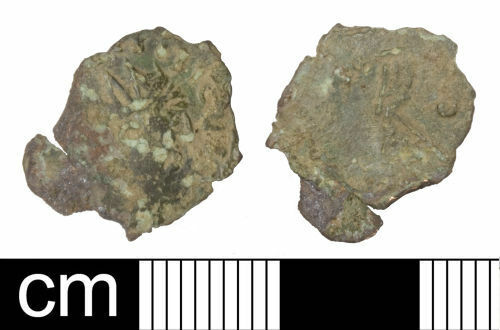 A Roman copper-alloy barbarous radiate copying Tetricus I or II dating to the period c. AD 275-285 (Reece period 14). Unclear reverse type probably depicting a standing figure. Mint uncertain. The flan is of irregular form and has been torn and bent at one end. A Barbarous radiate copying Tetricus II, 275-285 (Reece Period 14). The reverse type depicts a standing figure.